Introduction: Earlier this year, we covered the surprising BRSC68M from Daiko Japan. So impressed were we with this stick, we wanted to see what else this Japanese Rod Manufacturer had to offer. Only this time, instead of staying with their top-end product, we moved down a couple of steps looking for something less exotic and just a little more practical. Introducing the two-piece Daiko Gallet GLS-632L, a light action spinning rod that delivers just a hint of exotic flavor. Length from Back of Reel Seat to Base 7"
Impressions: Thanks to it's short, two-piece length, our latest Daiko stick arrived from Japan via the very affordable express mail service (EMS). Once I pulled it out of its packaging, I was pleased to find it wrapped in a very sturdy, nylon bag. This bag had two distinct compartments: one for the handle section and the other for the tip section of the rod. The two pieces are joined by the same type of friction joint as described in our Major Craft DC-644M review. While this stick is rather conservative and void of the traditional detailing I've come to appreciate in Japanese Domestic Market (JDM) rods, there are a few hints, here and there, of the rod's origins. Just the same, the important aspect here is the actual performance of this stick. Lab Tests: So where does this stick lineup with some of our domestic offerings? 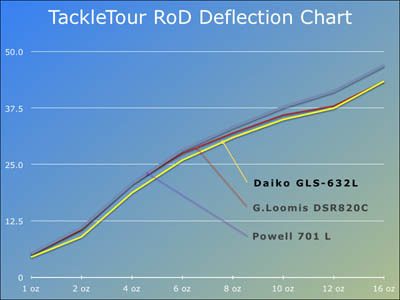 We compared the results of our deflection tests on the Daiko GLS-632L with that of our previously reviewed Powell 701L and previously measured G.Loomis DSR820C (a casting stick). This rod lined up very similarly to these two sticks. 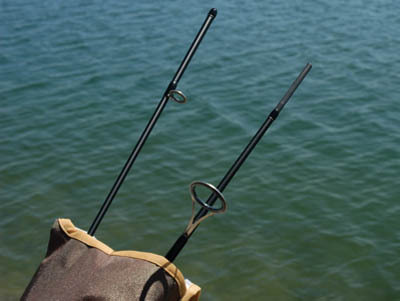 Rate of Deflection (RoD): The goal with our RoD WRACK measurements is to help you understand the characteristics of our review subjects so you can get an idea of what to expect if you're considering purchasing one of the rods we've reviewed. 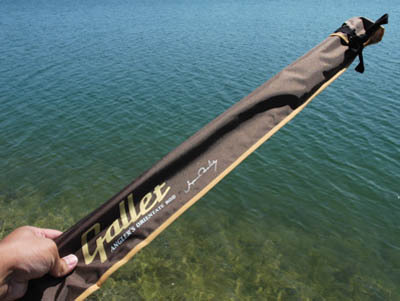 The challenge with most spinning rods is to find comparable test subjects within our vaults. Fortunately, with the Daiko GLS-632L, we have the data from our previously reviewed Powell 701L as well as our previously measured G.Loomis DSR820C. Even if the latter rod is a casting model, these two sticks tested out slightly more powerful than our GLS-632L with the DSR820C lining up more closely with our two-piece Daiko than the Powell spinning rod. 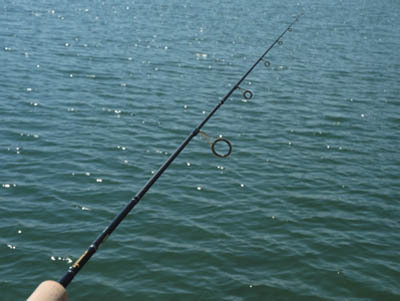 Spine, Weight, and Balance Point: Most spinning rods we come across have their spine aligned on top of the rod. Interestingly enough, our Daiko Gallet had its spine on top of the rod. 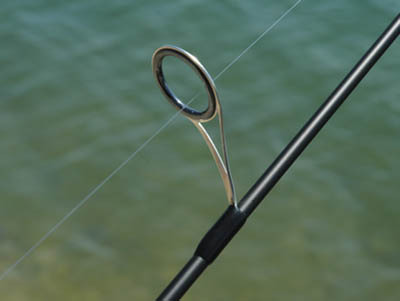 The balance point of this stick came out about seven and a half inches above the center of the reel seat and its weight measured at 3.7 ounces. It is rated as a fast action blank and viewing the bending characteristics of this rod when under load during our RoD WRACK torture session, I'd say this is accurate. So what did we learn through all of this? 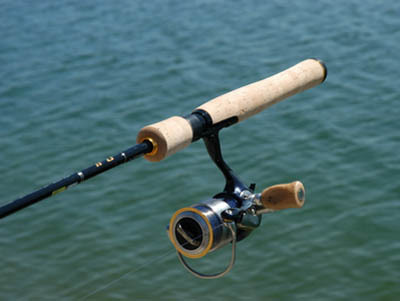 The Daiko GLS-632L is a rather proto-typical light action spinning rod. 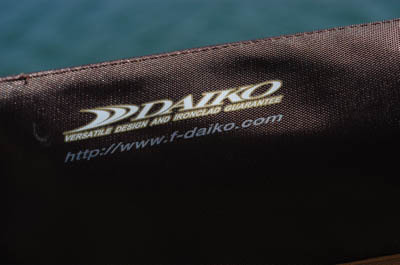 Real World Test: I took my new Daiko GLS-632L with me on a few fishing expeditions that included shore fishing and fishing from either mine or someone else's boat. Needless to say, the portability of the rod was invaluable on those adventures where I had no control over stowing options. I matched it up with a Daiwa Certate 2000 spooled with 6lb Yozuri Hybrid. Casting: Thanks to the rod's short overall length of 6'3", it was a pleasure casting the GLS-632L in and around cover and even the occasional skip under some docks. The fast action blank loads quite well and it handles lures within its recommended rating quite well. Unlike the Powell 701L, I did not push this particular rod beyond its limits because I was concerned with warranty issues but also the rod did not feel like it could quite handle it - as reinforced by the findings during our RoD WRACK measurements. The primary baits offered while fishing this rod were split shot rigs with 4" straight tail finesse worms. I also tossed some small, Luhr Jensen Speed Traps (1/8th oz size), and some 1/8th ounce fish head spin lures and it handled these baits quite well.